If you are just getting started with sailing, you may not be familiar with sailing terminology or the parts of a sailboat. Knowing the parts of a sailboat is a good idea considering that most sailing lessons will often refer to the terms. Also, it can aid with communication whenever you decide to wear your best sailing gloves and head out to the sea. While modern sailing boats may differ, the basic sailboat parts and terminology remains the same. In this article, we will be looking at the common parts of a sailboat. If you are already familiar with boating safety and looking forward to your next sailing trip, read on to know the terms to use when communicating with your crew. The mast is simply a pole that is placed vertically on the sailboat. It is used to support the sails. The mast is generally lightweight. You can easily raise it by hand. The boom is a horizontal pole which attaches to the sailboat’s mast. Its main purpose is to extend the mainsail foot. Both the mast and boom play a key role in harnessing the sailboat’s main power, which is the wind. The headsail and the mainsail assist in capturing the wind. When compared to the headsail, the mainsail is larger. The mainsail is responsible for capturing the wind power which helps propel the sailboat forward. The vertical part of the mainsail, which is also referred to as the sail luff, attaches to the boat’s mast at the rear. The horizontal part of the mainsail, which is also called the foot, is secured to the sailboat’s boom. To ensure that the mainsail acts as a vertical wing, the boom has to be rotated horizontally from the mast. If the wing shape is correctly presented to the wind direction, it creates high and low pressures on both sides of the sail. This has an effect of sucking the sailboat forward. Finding the right angle of the mainsail to the wind will result in maximum power. The headsail can either be a jib, a Genoa, or a spinnaker. Each of these headsails is ideal for different purposes, depending on wind direction in relation to the sailing direction. The Genoa and the jib help harness the wind power. However, they also help increase the wind speed across the mainsail when the boat is sailing across or towards the direction of the wind. When tacking the sailboat, the jib does have the effect of steering its bow. The spinnaker is more common on racing yachts. After sailing, the sails are supposed to be removed. When you decide you would like to wear your best sailing shoes and head to the sea again, you can re-install the sails. On the different types of boats used for sailing, the mast step is generally a stainless steel mounting piece. It is usually affixed to the boat. In most sailboat models, a pin that emerges from both sides of the mast fits into a slot available on the mast step. After stepping the mast, it has to be secured using shrouds and stays. The shrouds and stays simply refer to the wires which help ensure that the mast stays upright. The front wire is generally referred to as the forestay. If after wearing your best sailing shorts and pants you intend to sail on a small boat, you should expect to find the rudder mounted on the hull’s stern. The rudder is a long and thin blade which hangs vertically from a set of hinges. The set of hinges may vary among different boats. The rudder, which swings from side to side, is generally pivoted on a vertical axis. The purpose of the rudder is to turn the sailboat when moving through the water. After sailing, you can decide to either keep the rudder on the sailboat or remove it. If you decide to remove the rudder after sailing, you can always re-install it pretty easily when rigging your sailboat. Unlike cars, which are steered from the front, sailboats are steered from the rear. Two parts of a sailboat work together to aid with the steering. The sailboat parts which assist with the steering are the tiller and the rudder. 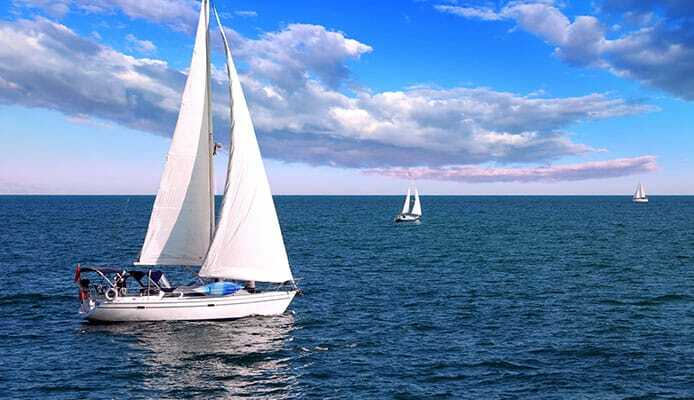 To give you an example, if you intend to steer your sailboat to the right, all you will have to do is pull the tiller to the right-hand side of your boat. This will cause the rudder to alter its direction. The tiller is a long metal arm which extends from the rudder’s top into the cockpit. In some sailboats, the tiller is made using wood. Tillers often feature a handle which is referred to as the tiller extension. The tiller extension mounts close to the tiller’s end. You can move it far out or to the side of the sailboat. Similar to reefing a sailboat, the tiller extension helps improve the sailboat’s performance. If you are sailing close to the wind, you may have to move your body weight far out to the side in order to ensure that the boat is balanced. This is referred to as hiking out. The tiller extension makes hiking out possible. The forces present on the rudder may be too large such that steering the boat with the rudder may be impossible. To ensure that steering the sailboat is possible irrespective of the force available on the rudder, most large sailboats make use of a wheel apparatus to turn the rudder. As noted earlier on, the boom attaches to the mast. The fitting that the boom uses to attach to the mast is referred to as the gooseneck. The gooseneck makes it possible for the boom to pivot up and down. It is also responsible for ensuring that the boom is capable of swinging out to both sides. These sailboat parts make things much easier for the sailor when he/she is installing the sails. The Halyards are simply lines which pull the sails up the sailboat’s mast. Most small boats will have two sails – the mainsail and the jib. For this reason, small boats have 2 halyards. Each halyard helps pull up each sail’s top corner (head). The number of halyards present on a sailboat may vary depending on the size of the sailboat. If you already know how to avoid seasickness, you may decide to head out to the sea with a bigger sailboat. Your bigger sailboat may have more halyards. A fitting is available at the end of the halyard. The fitting, often referred to as the shackle, helps attach the sail to the line. The line runs up to a pulley (usually referred to as the block by sailors) at the masthead and then comes down alongside the sailboat’s mast. To hoist the sail up, all you will need to do is pull down on the end of the halyard. Once the sail is pulled up, the halyard is supposed to be tied tightly to the mast cleat. For this, you can use a cleat hitch. The halyards are part of the sailboat’s running rigging. Simply defined “running rigging” are the lines which aid with controlling the boat’s sails and other boat riggings. When sailing, you can always opt to remove the running rigging. Unlike standing rigging and other fixed components, such as the mast, stays, shrouds, and boom, the running rigging can be removed and re-installed pretty easily. The mainsheet is another key part of the running rigging. On most sailboats, the line runs between the sailboats boom and a fixed point on the cabin top or the cockpit. If the line is let out, it allows the mainsail and the boom to swing farther out from your boat’s centerline. Moving the sails in or out, referred to as trimming the sails, is required when you are sailing at different angles to the wind. Trimming the sails, similar to using a sailboat winch to raise the sail, will help you improve your sailboat’s performance. Even when you are sailing in a small boat, the force on the boat’s mainsail may be high. Using a block and tackle in the sailboat’s mainsheet will offer a mechanical advantage. The mechanical advantage will make it possible for the mainsail to be managed by just one person. One individual will be able to use just a single hand to control the mainsheet while sailing. 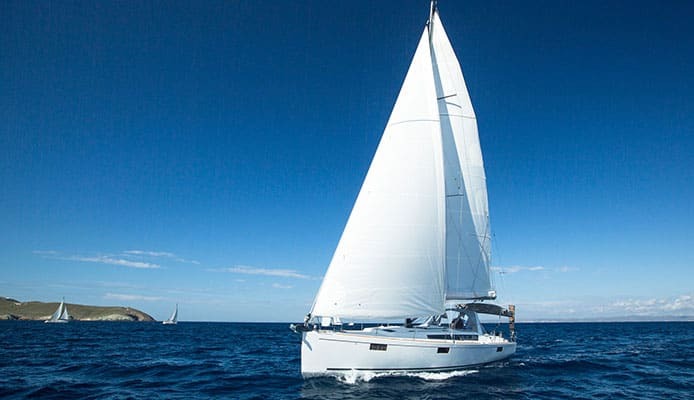 If you have decided to invest in a larger sailboat, you shouldn’t look for the mainsheet mount on the cabin top or the cockpit. On larger boats, the mainsheet mounts from the boom to the traveler. Similar to being able to charge your devices using the sailboat’s solar panel while navigating the sea, the traveler makes your life much easier. It allows you to move the attachment from side to side to achieve better sail shape. A clam cleat is available where the boat’s mainsheet exits the block and tackle. The purpose of the cleat is to ensure that the mainsheet stays in place after you adjust it. After putting the jib sail on the forestay, a sheet is often run from the sail’s aft corner on all sides of the mast back to the cockpit. The jib sheets make it possible for you to trim the jib when out sailing. Both the cam cleat and the jib sheet are among the parts of a sailboat which go hand in hand. Each jib sheet on a sailboat is led back through the cam cleat. The cam cleat is responsible for ensuring the line stays in place. The clam cleat jaws are built in a way that only allows the line to be pulled backward but not slip forward. Whenever you grab your best sailing sunglasses, you are probably looking forward to an easy time while navigating the ocean. The centerboard is one of the parts of a sailboat which make your navigation easier. It helps ensure that the sailboat does not capsize. It does this by providing resistance to ensure that the wind does not blow your sailboat sideways. The centerboard is simply a long and thin blade which is mounted on a pivot point on one end. If you happen to let the centerboard’s control line out, the sailboat part will swing down into the water. On smaller boats, the centerboard can swing up to a depth of approximately 3 feet. The centerboard is aerodynamically designed to ensure that it causes as little drag as possible. It slices cleanly through the seawater as the sailboat moves forward. The centerboard control line is kept in place by a clam cleat. The clam cleat holds the centerboard and ensures that it does not move forward. The term clam cleat is derived from the cleat’s shape. While the clam cleat may not be as strong as the cleat used with the jib sheet and the mainsheet, the clam cleat is capable of doing its job. This is made possible by the fact that the force available on the centerboard line is much less. On some boats, the part that has the same function as the centerboard may be referred to as the daggerboard or the keel. The daggerboard is much more similar to the centerboard. However, unlike the daggerboard and the centerboard, the keel cannot be raised from the water. If your sailboat has a daggerboard or a centerboard, you can raise the sailboat part when sailing downwind and bring them down into the water when sailing towards the wind. Forefoot – This refers to the bow’s underwater angle curving back to the sailboat’s keel. Heel – This is the keel’s back corner. Leading edge – This term refers to the keel’s front face. Trailing edge – This is the back face of the keel. The hull is one of the simplest parts of a sailboat. Even if you are getting to understand the top sailing tips for beginners, you probably already know what the hull is. The hull is the sailboat’s body. The waterline is the term used to refer to the dividing line between the hull above the water and below the water. The part that is above the water is generally referred to as the topsides. The hull part that stays below the water is known as the underbody. The point where the sailboat sides join the deck is referred to as the gunnel or gunwale. The measurement from the waterline to the gunwale is referred to as the freeboard. If you intend to make sailing your next pastime activity, understanding the sailboat parts is important. Knowing the different parts of a sailboat can help with communication when you are out in the sea. Also, understanding parts of a sailboat can help with your sailing lessons. Numerous sailboats are available. While they may differ in appearance, most sailboats will have the same basic parts. This article helps you understand all the basic parts of a sailboat.